Engine hours are since Overhauled unit fitted in 2011. The engine room accessible from deck and from the crew quarters and the steering cockpit sole lifts to give access to generator. Navtec hydraulic back stay and boom vang. 220 volt, 12 batteries charged by: engine, shore power, generator 12 / 24 & 220 volt systems, Victron and Mastervolt battery chargers, Mastervolt Inverter, Seafresh 100 liters per hour Watermaker. Built to R.I.N.A 100a – 1.1 “y” Classification. With white painted aluminum hull, deck and superstructure, teak laid decks with foot rails all round and an extended stern bathing platform giving an LOA of 24.4 m.
Fin keel with 13,500 kg of Lead ballast. 2 each Grey and Black water holding tanks. From the drawing board of Andrea Valicelli who designed the Italian Challenge 12 m IRC yachts, which all went by the name of "Azzurra", for the 1983 America's Cup in the US of A and the 1987 America's Cup in Australia. This Cruiser / Racer had a Cummins 6BTA 370 Hp overhauled engine installed June 2011 and a new Quantum dacron mainsail, genoa and staysail fitted in May 2011. She is Langkawi registered and lying in Malaysia. A great boat for the sporting owner who wants to do more than just regattas or for the charter market. 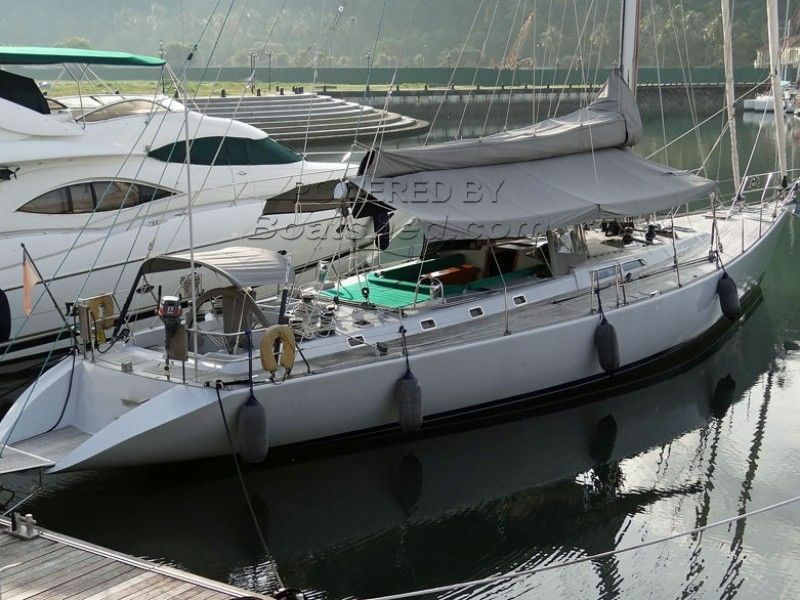 This Andrea Valicelli 20 M has been personally photographed and viewed by Alan of Boatshed Langkawi. Click here for contact details.